16. Adrianne Wortzel, FF Alumn, at Cooper Union for the Advancement of Science and Art, Manhattan, December 6.
low profile on the international art scene. strut with Mr. Ai, who dances joyfully and waves with handcuffs. lust for life. At the same time, it is political," says Ms. Faurschou. museums, including the Guggenheim Museum in New York. "They offer potentially more to borrow for institutions than the Danish National Gallery,"
says Michael Jeppesen, an art critic at the newspaper Danish Daily Information. Mr.
million). The Faurschous decline to comment on the number. square-foot exhibition space where Chinese artist Cai Guo-Qiang is on display. landscapes of the mind. Agnes Denes went both ways. understanding of how we think and behave. More readily comprehensible but existing now only in documentary photographs was Ms.
Finland, a conical hill planted with 11,000 fir trees in a complex spiral pattern. scale museum retrospective to do that. and her son's baby shoes). most chilling images into pages torn from "House Beautiful" magazine. assembling it was amplified by the vicissitudes of Hurricane Sandy. wall, for which, she said, she was willing to pay as much as $50. "If you buy a piece of Martha Rosler-curated stuff, do you use it?" Mr. Firestone asked. tables and shelves displaying actual everyday things. pilled, too. That's why it's priced so low." Will Gilman, 32, was wearing. that she had bought five this year, average price $15, from eBay and other sources. "That would be high, except it has added value." my sister got divorced, she burned her wedding album in the Chiminea." white photographs. "They are dead," she said. "Don't feel bad, I scanned all the images. She's my aunt. It's a celebration of her. She was an artist. Now she's in MoMA!" "Under no circumstances," she said firmly. and commenting on the messiness. sifted through them with deft fingers. colors," she said. "The dead colors, that's me!" She had just bought a bobble-edged scarf ($6, haggled down from $7) that "went"
she sells at the Columbus Avenue Flea most weekends. over to reveal a little stainless steel plaque that read "Goodies by Gay." should drop something, make a scene. What are the limits of this performance?" for their expressions, priced at $12, $11 and $10. Relieved, the shopper approached a cashier with the $10 cow. "Do you want to haggle?" the young woman at the register asked politely. "Yes, please, may I have it for $5?" "We can hold it for you," the woman said. The shopper nodded, deflated. She knew she wouldn't return. reducing poetry to letters and phonemes. in a limited edition of fifty copies, and available from blackscatbooks.com. of the Ateneo de Manila University on Loyola Heights in Quezon City, metro Manila. the invocation will be recited by Rene Javellana, SJ. the good luck to meet those people as he was growing up in Manila where he was born. selection of current shows our team of editors can't stop talking about. muted, stylized landscapes of the veteran British painter Jon Bird. "Vito Marcantonio: Fighter for Puerto Rico's Independence"
"Marcantonio and Luis Muñoz Marín: Cooperation and Conflict"
"Dear Marc, Letters to Marcantonio: A Dramatic Reading"
special status in their history and memory. 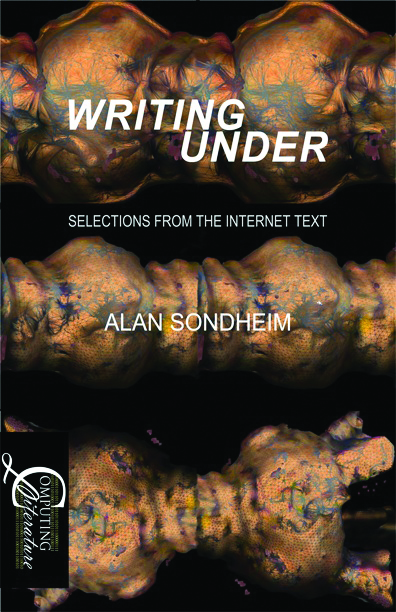 Alan Sondheim pens Writing Under: Selection from "The Internet Text"
writing as it takes place on and through the networked computer. Sondheim.s writing online is entitled "The Internet Text." writing takes place today and into the unique practices of a writer. a path for writing.s future. that have the world and its 'genesis redux' in their grip." Christopher T.
that the real world has in the virtual. world and its 'genesis redux' in their grip." comprehension, leaving multiple re-reads a definite must." transformations that merge (with) the physical and technological. psychedelic landscapes in Second Life, and an inveterate graphophile. Part of the Croatian Festival in France, "Croatie la voice"
be exhibited, designed as a dynamic encounter. visualisation of the Fracs' similarities and differences. materials, such as adhesive tape and electric cables applied directly to the wall or floor. Nantes's past as a centre of slave trading. 1960s and might encounter completely different realities when returning to Croatia today. environment, her country's past history and wastelands. scientific and artistic fields provide a framework for his work. the effects of this on the perception of the video itself. active art centres in Croatia today. crystallisation of sublimated caffeine on glass and textile. 22 and be on view through February 2013.
book in relation to each other is based on their location on the page in Finnegans Wake. accepting (not questioning) the nature of art." Turkey. A catalogue of this exhibition has been published. 55,000-square-foot Wade Thompson Drill Hall. to visitors who will be able to "carry" the voices as they traverse the installation. reading voices, and the room behind them as seen in a mirror reflection. kinetic system and an experience of communal connectivity. is currently a Distinguished University Professor of Art at The Ohio State University. amenities-offering dynamic environments for artists and audiences alike. Scenes Believing, an exhibition at KMOCA, 103 Abeel Street, Kingston, NY, from Nov.
3-24, includes the work of Christy Rupp and Robin Tewes, FF Alumns. National Laboratory and Sandia National Laboratories in New Mexico. Thursday, December 6, 5 PM. presence would be welcome gifts. If you're far away, please spread the word! Sacrilege is Needed. Competency is Hell. brain states. With radically imagistic language that dances, & possessed movement. Also performing the same evening: devynn emory, Niall Jones. mobile, aboveground archive and exhibition space. thus creating a clean slate. experience life in a post-archival, post-traumatic state. NY was featured in the New York Times, The New Yorker and the Village Voice. patriotic Old Glory Condom Corporation, which won a controversial US Trademark. Jay's movie, Toilet Treatments, won an HBO Award at the Provincetown Film Festival. Portland, Oregon. Jay has artist residencies in Spain and France in 2013.
building, the trailer is licensed, 'cargo worthy'-to exhibit anywhere. internationally and are in numerous collections. said,'People themselves are more important than bridges,' and so I followed his lead." daily basis, seeking to shed light on the essence and transcendence of human connection. memories through conversations, quotidian activities or performative actions. scheduled for Thursday, November 22, 2012 at 7 pm at the Bohemian Club in Mostar. grant from the Trust for Mutual Understanding. Dominican Republic, he lives and works in the South Bronx. Special thanks to Srđan Gavrilović and Miki Olabarri Powell. and values of public space. Portrait Gallery in Washington in 2010."